What Psychiatry Left Out of the DSM-5: Historical Mental Disorders Today covers the diagnoses that the Diagnostic and Statistical Manual of Mental Disorders (DSM) failed to include, along with diagnoses that should not have been included, but were. Psychiatry as a field is over two centuries old and over that time has gathered great wisdom about mental illnesses. Today, much of that knowledge has been ignored and we have diagnoses such as "schizophrenia" and "bipolar disorder" that do not correspond to the diseases found in nature; we have also left out disease labels that on a historical basis may be real. Edward Shorter proposes a history-driven alternative to the DSM. "Every scientific field grinds to a halt from time to time and psychiatry is currently stuck in a cul-de-sac. This is when forgotten or inconvenient observations from the past can provide the best way forward. In What Psychiatry Left Out of the DSM-5, Edward Shorter gives us a series of cornerstones that will have to be included in any new building if it is to stand. This book offers food for thought and is a great read" -- David Healy, Professor of Psychiatry, Bangor University; Author, Pharmageddon. "Arguing that recent DSM "knowledge destruction engine" classification systems have been catastrophic for psychiatry, Edward Shorter’s polemic is written with a brio-fired challenge. If psychiatry has lost the plot in classifying psychiatric diseases, why not have a model provided by a historian? His ‘remembrance and respect of things past’ model builds on the wisdom of the consensual experiences clinicians accumulated over the centuries. Here, Shorter demonstrates his masterful and profound capacity to intertwine charting the history of psychiatric classification and to critically appraise it. This is a book to be read by all who wish to understand psychiatry’s historical territory and consider a stimulating and provocative alternate road map." -- Gordon Parker, PhD, Scientia Professor of Psychiatry, University of NSW, Australia. 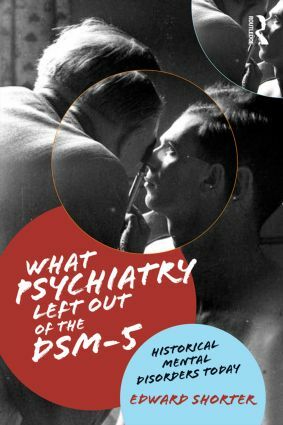 "…Here, Shorter demonstrates his masterful and profound capacity to intertwine charting the history of psychiatric classification and to critically appraise it. This is a book to be read by all who wish to understand psychiatry’s historical territory and consider a stimulating and provocative alternate road map." -- Gordon Parker, PhD, Scientia Professor of Psychiatry, University of NSW, Australia.